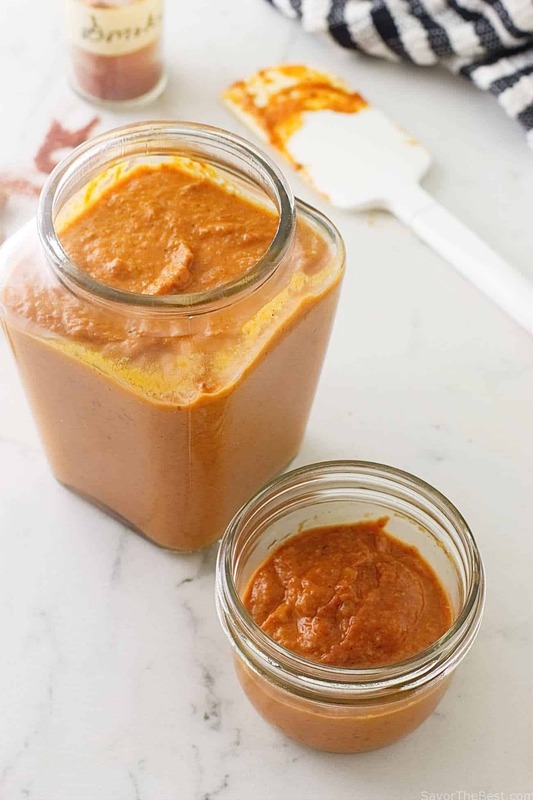 One taste of this wonderful Spanish Romesco Sauce and you will be blown away by the explosion of flavors and the smooth, silky texture of this rustic all-purpose sauce. This is Spain’s flagship sauce that originated in Catalonia and is loved all throughout Spain. There are many versions of this savory romesco sauce. Competitions are held in Spain for the best one as each contestant puts their own spin on it and considers theirs ‘The Best!’ And when the calcots are in season they celebrate with a Calçotada Festival of grilled calcots dipped in this luscious romesco sauce. Spanish Romesco Sauce is Spain’s version of Italy’s marinara sauce and it is a welcome alternative. This savory sauce gets it’s vibrant color from the roasted tomatoes and sweet peppers while the toasted Marcona almonds give it a rich creaminess. Romesco sauce is a super-flavorful sauce made with sweet red peppers, tomatoes, mild chilies, garlic, and onions. But the one ingredient that is key to this flavorful sauce is the smoked paprika! It really puts the Wow! in this sauce! We used a combination of red bell peppers and those lovely long, sweet Italian red peppers. The Italian red peppers are currently in season and we have stocked our fridge with them. They are also known as sweet Italian grilling peppers and we have been enjoying them grilled. See our post here. They have the same flavor profile as a sweet red bell pepper. Spanish restaurants are appearing more frequently in America’s cities, with tapas bars where you can make an entire meal of many small plates of their cuisine. Recently, we visited the Spanish restaurant, Toro Bravo, in Portland, Oregon and spent a memorable two-hour dinner enjoying tapas of every type. They served this vibrant-colored Romesco sauce with grilled octopus and we were hooked! With the exception of Marcona almonds, we are willing to bet that most of the ingredients are right there in your pantry. Marcona almonds are imported to America from Spain in packages and stocked on the nut racks of most supermarkets, but they can be a bit pricey You can also find Marcona almonds in the bulk foods section of some markets and Whole Foods for sure. If you buy just a small amount of them it will not break your grocery budget. They will add a silkiness to the texture of the romesco sauce. Or, just substitute with regular almonds. 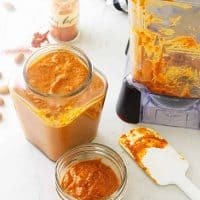 Making this incredible tasting romesco sauce couldn’t be easier and it will keep for a week in the refrigerator. After the vegetables are roasted, cooled and peeled they are combined in a food blender and processed with almonds, bread, olive oil and a couple rehydrated and seeded mild chilies. And then! We added the magic of smoky paprika. Spanish Romesco Sauce is delicious with fish, poultry, meats and vegetables. Serving it on scrambled eggs will transform a breakfast from boring to gourmet! Set out a dish as a dip with slices of thin toasted bread. Toss it with a plate of pasta and chorizo. Slather it on grilled chicken or use it as a marinade. The ideas are endless and always delicious! You need this Spanish Romesco Sauce in your life! 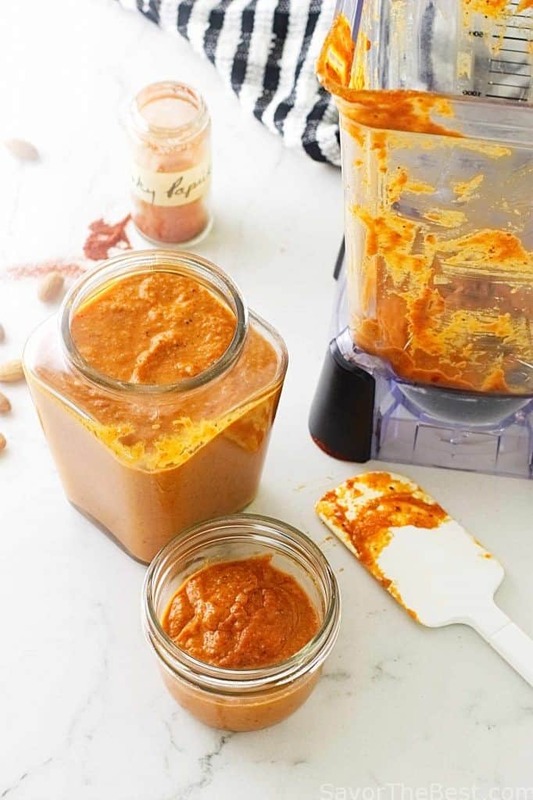 Romesco sauce is a super-flavorful sauce made with sweet red peppers, tomatoes, mild chilies, garlic and onions. But the one ingredient that is key to this flavorful sauce is the smoked paprika! It really puts the Wow! in this sauce! Add the peppers, tomatoes, garlic and onion to a parchment lined baking sheet. 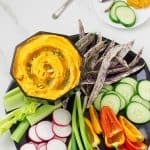 Brush the vegetables with 2 tablespoons of the oil and roast until they are soft and slightly charred, about 25-30 minutes. While the vegetables are roasting, place the dried chilies in a bowl and cover with hot water. Soak for 15 minutes or till rehydrated. Strain, and remove the seeds. Place the chilies in a blender and puree until smooth. Add the puree to a fine-mesh sieve set over a bowl, press with the back of the spoon. 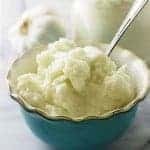 Reserve the puree, discard the solids. Add 1 tablespoon of the olive oil to a small skillet set over low heat. Add the almonds and stir to brown them a little, about 1 minute. Transfer the almonds to a small plate lined with a paper towel to absorb the oil. Add the bread to the pan and cook until it becomes a nice brown color, around 30 seconds on each side. Remove the bread from the pan and set it aside. When the roasted vegetables are cool enough to handle, peel them. Remove the seeds, tops and membranes from the peppers. Break the garlic loose and squeeze the cloves out. Cut the core stem from the tomatoes. 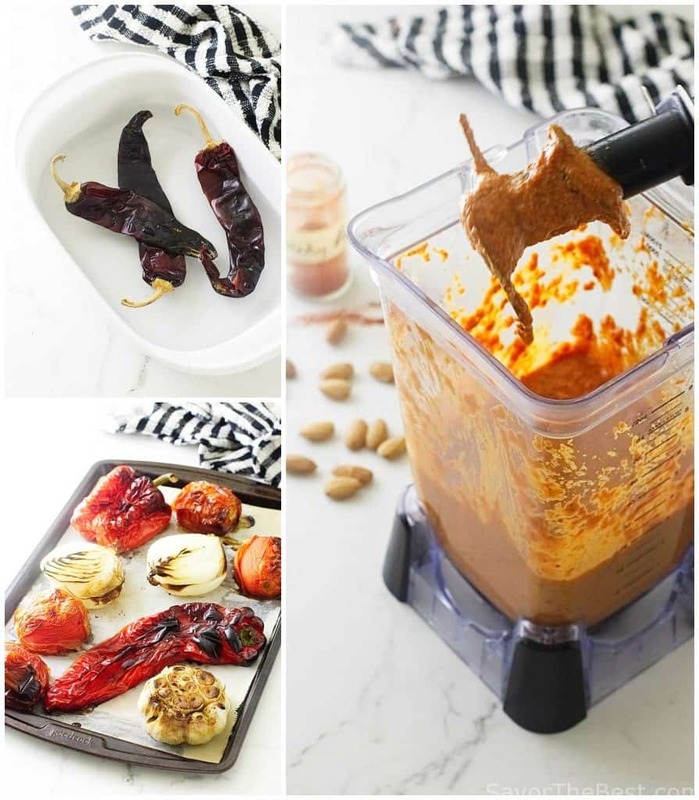 Add the roasted vegetables to a blender or food processor along with the 1/3 of the chili puree, almonds, toasted bread, lemon juice, smoked pimento and the remaining olive oil and salt. 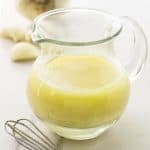 Blend until it forms a thick sauce. We used a combination of red bell and sweet Italian peppers which have the same taste as a standard red bell pepper. Although some versions of romesco sauce are made with a powerful kick from hot chiles, the traditional romesco sauce was not meant to be spicy-hot and the small mild ñora chiles are used. If they are unavailable substitute with any other mild dried chili. 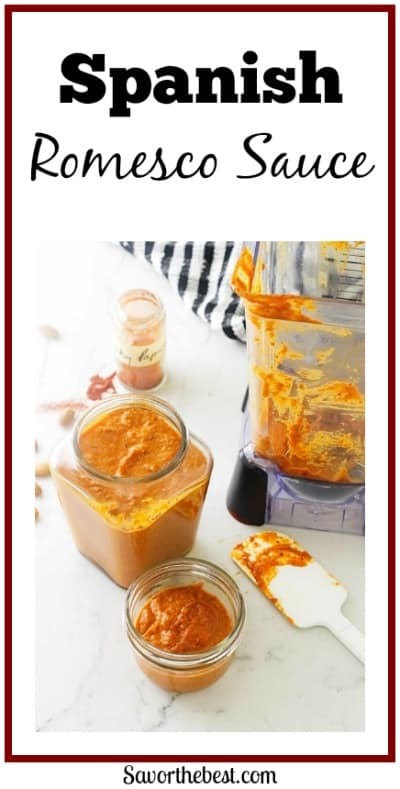 Have you made this Spanish romesco sauce? We would love to hear from you. Oh my goodness that sauce looks just heavenly! I love that the vegetables are roasted. It adds so much to the flavors. 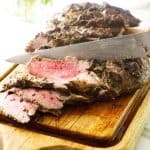 I can’t wait to give your recipe a try! Nothing compares to a great sauce! This looks fantastic. I can see using it for so many different things! I love romesco sauce! I usually make it with a mix of hazelnuts and almonds, but you’re so right that Marcona almonds would make it feel extra luxurious! Hi, Mary….Have you tried the green romesco sauce? I make that with the hazelnuts…yum! This makes a fine topping for pretty much any vegetable sturdy enough to hold its own against the thick, pungent sauce. Thanks for sharing. Such a great sauce! I loved eating tapas in Spain. Can’t wait to try making my own! omg! the flavors are outstanding and sound so good.Need to try this one. I’m drooling. I could really cook up something spectacular with this romesco. Will have to make some of my own. I love finding a new product to spice up my classic favorite dishes! Love a good romesco sauce and imagine this version tastes awesome with the smoked paprika! You said it will keep for a week. Not in our house! haha this sauce would be gone in a couple of days!! That’s a sweet recipe plugin you got there ? ❤️ We love hearing that!